The tournament was a huge success, there were over 100 players from 16 countries. 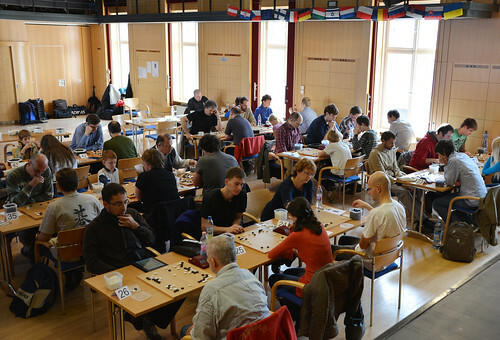 Many of Europe's top players attended, and this made European Hans Pietsch Memorial the strongest European tournament in 2013. 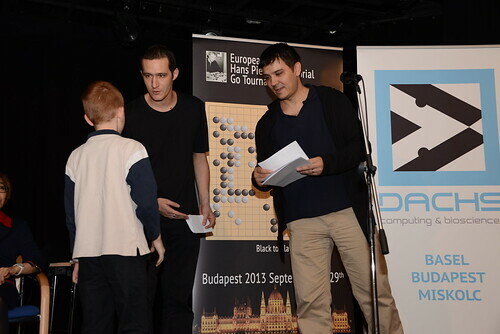 We are planning to continue with Budapest Open Go Tournament next year! Although the event has started on Friday, a lot of guests had already arrived on Thursday. So we decided to hold a reception on Thursday evening in the go club at the community center Muszi. 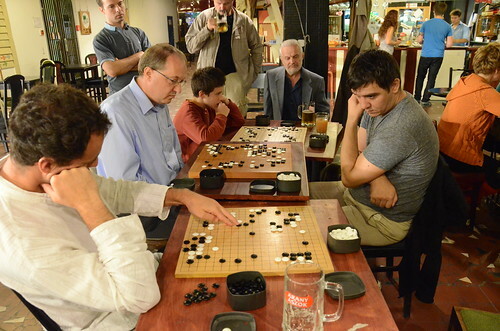 Catalin Taranu was giving simultaneous games for early arrivals and organizers of the tournament. The tournament system had a special system. Top 8 players started in the super group, and next 32 players followed from one point less. After 3 rounds top 8 was separated from the field to play a knockout to decide first 8 places. From the first group a 2/1 result was required to get in the finals, and from the second group 3/0. Finally there were 5 finalists from the top group and 3 from the second group. This means that regarding the top places the tournament was a success. However on the lower boards there were some unbalanced matches, so we will try to improve the system next time. The games in the top room were very tense. But there is always time for reunion. 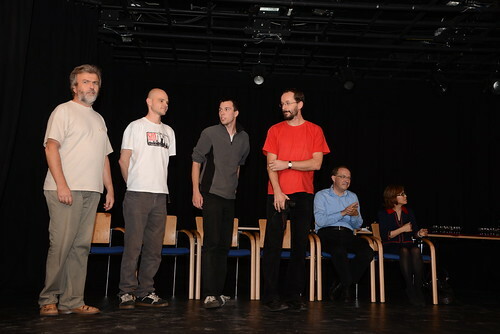 The opening ceremony was held after the first round. There was a reception with drinks and some food. 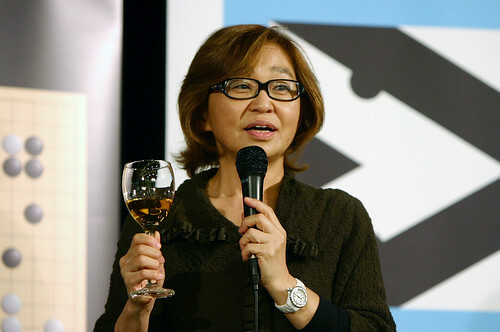 Kobayashi Chizu 5p from Japan gave the memorial speech about Hans and she conducted Kanpai. The tournament continued on Saturday morning. In the breaks Chizu sensei was giving lectures about Hans's most memorable games. The game after the second round was a special New Years match between Catalin and Hans from 15 years ago. This event is a regular television program in Japan, it was a really special occasion to have two Western professionals playing it. To top it, the commentator for the television was Michael Redmond 9p. After the third round top 8 was separated to play a knockout tournament to decide the exact places from 1st to 8th. Thus the 3rd round was extremely tense, there were 6 death matches to get in the finals of the tournament. 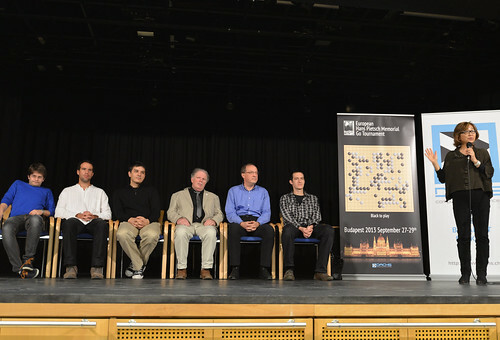 Only the players on the top board, Antti Tormanen from Finland and Cornel Burzo from Romania had had secure places in the finals. 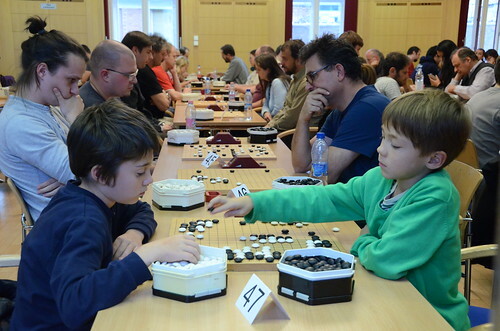 Between 2nd and 6th boards players from the top group were challenged by undefeated players from the second group. Catalin Taranu 5p (ROM) beat an other fellow Romanian, Lucretiu Calota 5d. Dusan Mitic 6d (SRB ) won against Christian Pop 7d (ROM), thus became one of the players who kicked out someone from the top group. Viktor Lin 5d (AUT) beat Zhao Pei 6d (GER) Viktor was the second player to qualify from second group. Balogh Pal 6d (HUN) beat Ali Jabarin 6d (ISL), thus became the third player from the second group to join the finals. Ondrej played an experimental move in the opening, but he got behind. Ondrej fought back hard, but immediately after the game got even, he played a careless move and it was all over. Dusan was leading but he missed his chance to simplify the game. Thus Antti was able to launch a surprise attack, and turn the tables. This is a great fighting game starting with a nadare variation. Pal took an early lead, but Pavol is very strong in complicating any position. This case it was not enough. Viktor fought very well in this game, but being in byoyomi, missed a chance at a crucial point of the game, and collapsed. The semifinals were played in the morning. As a result we were looking forward to a Finno-Ugric final, played between Antti and Pal, the first ever encounter between these two players in a tournament. Cornel missed a chance to complicate things when behind, so this was a relatively easy victory for Antti. Catalin played for thickness, but Pal played several nice well balanced moves to frustrate any attacks before they even started. 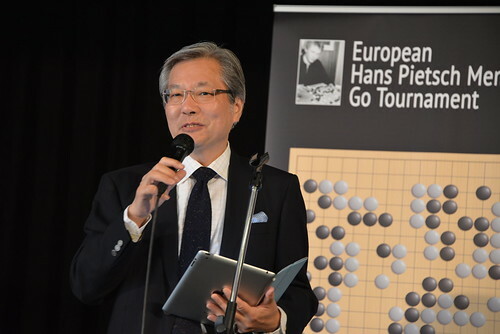 Before the final round began we had a visit from his Excellency Yamamoto Tadamichi ambassador of Japan to Hungary. Mr Yamamoto knew Chizu sensei while he was stationed in Paris. ...and watching the deciding game of the tournament. Antti took an early lead, and frustrated any attempt by Pal to upset it. This game is a good example how to simplify a favorable position into a victory. Finno-Ugric final: Antti Tormanen vs Pal Balogh in their first ever encounter. Catalin started well in this game, but things got complicated. The highlight of thes game is a spectacular furikawari. Chizu sensei was giving live commentary on the final games. 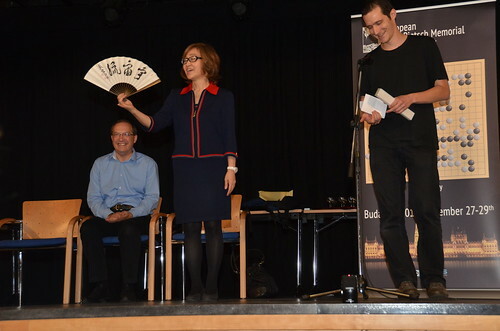 The money prizes were provided by DACHS GmbH and the presents by Kobayashi Chizu sensei and Kuroki Gobanten company, the producer of vintage go stones. Every participant got this nice present from Kuroki Gobanten company, a strap with slate and shell go stones. There were two very valuable special prizes, two original fans signed by the mighty Takemiya Masaki 9p. These presents were awarded for some extraordinary achievement beyond results. The presents were awarded to Mijodrag Stankovic 5d from Serbia for having so nice and good mannered students like the Mitic brothers. The other fan went to Toth Zoltan 4k (HUN) for enjoying playing and not caring about the results at all. There were many volunteers helping this tournament. They are the ones who make things happen, without them there would not be any tournaments. To express our gratitude they got were presented by printed fans from Japan. On the picture Csaba Katona, Tamas Fogarasi, Balint Zahonyi and Zoltan Halasz. 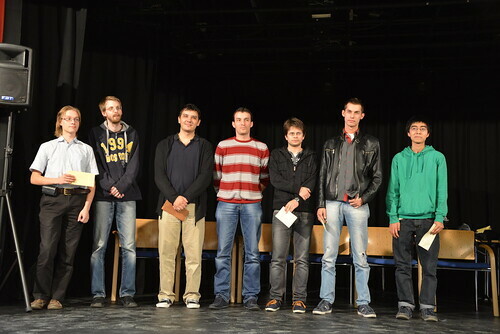 Missing from the picture are Juli Seres and Gergely Szabo. After the tournament many foreign players had stayed until Monday, so we decided to show them the nicest pubs of Budapest.